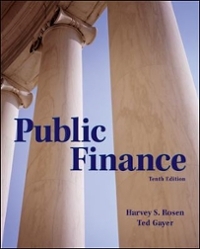 Public Finance 10 Edition Public Finance benefits from the combined efforts of Harvey Rosen’s market-leading book and co-author Ted Gayer’s research and government agency experience. This combination of experience is able to explain as clearly as possible how the tools of economics can be used to analyze government expenditure and tax policies. This new edition incorporates recent developments and along the way takes students to the frontiers of current research and policy. While the information presented is cutting edge and reflects the work of economists currently active in the field, the approach makes the text accessible to undergraduates whose only prior exposure to economics is at the introductory level.All of the changes in the Tenth edition were made to further the authors’ goal of providing students with a clear and coherent view of the role of government spending and taxation. The authors’ years of policy experience have convinced themselves that modern public finance provides a practical and invaluable framework for thinking about policy issues. The goal is simple: to emphasize the links between sound economics and the analysis of real-world policy problems.